Lilike walked toward the gates of Dargon Keep late on the last day of the mid-year festival of Melrin. She watched wistfully as well-dressed couples wandered happily away from the keep; she would have loved to have attended the Melrin Ball as they had, but as the mere apprentice of Rebecca the healer, she wasn’t one of those who was privileged enough to receive an invitation. Cavendish the scribe, whose house she was watching for the sennight, had given her permission to use his, but she had nothing fancy enough to wear and she knew she would have been out of place. She would not have even come to the gates, except that at the last mene she had been asked to perform a task. Lilike turned away from the tall doors at the front of the keep and went around to the servants’ entrance on the south side. People were going in and out of that small door with intent looks on their faces and she had no trouble slipping through without comment. She made her way between the passing servers, falling in behind one who carried two buckets of water on a yoke. She followed him through the twisting passageways and up a winding staircase into the ballroom. In the ballroom, the festive decorations hung over the banquet tables, which were still groaning with untouched food. The stage at one end of the hall was empty of all but chairs, and Lilike wondered what the musicians had played, and how elegant the dancers had looked moving to it. The Melrin festivities were always lavish, even in the poorest sections of town where she had grown up, and the Melrin Ball on the last day of the holiday was always the most spectacular, but the nobles celebrated in a fashion that Lilike couldn’t even imagine. She scanned the room and found her goal. “Oh, there you are, Cereid!” Lilike called as she approached her friend. The young Olean priest was looking uncomfortable as he stood there in his robes, and Lilike knew why: he had a rash somewhere beneath them. Despite her occupation as a healer, he had refused to show her the rash, even while asking that she make a salve for it. She knew it was because of his growing affection for her; it made him very self-conscious whenever they were together. She had spent all day concocting the healing balm and had come to deliver it. “Do you have it?” he asked anxiously. Cereid began to stammer nervously, shaking his head, and then Lilike saw his eyes widen. He pointed over her shoulder and said, “Over there.” She turned and saw a window alcove with a curtain bunched up to one side. Cereid strode over to it and reached for the curtain. As Lilike followed, he said, “Please keep an eye out while I apply this.” She nodded as he pulled the curtain closed. The clearly heard response, “Sorry, Courtney, but you can be so stubborn about your convictions!” made Lilike turn her head to find two priests of the Creators pantheon — she thought they were of the highest, or euilamon, rank — standing right next to her. She let out a little squeak of surprise, and while both women directed their gazes at her she frantically tried to think up an excuse as to why she was standing there. Her heart started hammering as the plain one reached toward her with a frown on her face. 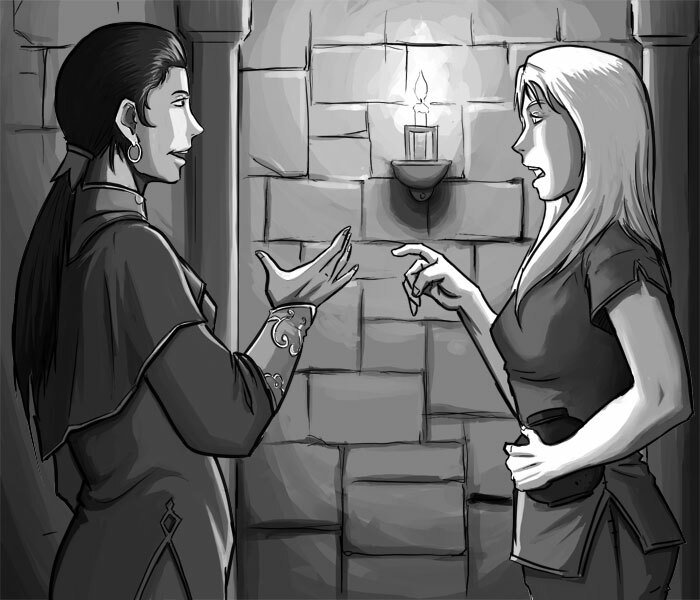 Lilike breathed a sigh of relief when the woman’s fingers grasped at something behind her. She turned her head and glimpsed the raveled thread dangling from a section of subtle embroidery on the curtain. The euilamon pulled on that thread and the entire curtain tumbled to the ground. The two euilamon calmly said, “Oh my,” as Lilike turned around to make sure that Cereid had not been hurt by the falling curtain rod. She echoed the “Oh my,” as she saw him standing there with his robe tucked under his armpits, clay pot in one hand, his other hand halted in mid-application of the salve, not to his backside, but to his front. Her eyes met his red-faced gaze. She remembered her daydream of a moment earlier, and blushed. “You’re kidding!” Cereid said. “By Ol’s huge nose, could this possibly get worse? If they take this story back to my superiors, who knows what will happen? !” He winced yet again. “We could find them and explain,” suggested Lilike. “By the way, how is the rash?” Lilike asked. “No, no, we should just avoid them, not complicate matters.” Cereid gasped in pain and shifted his feet farther apart, then continued, “The rash is … Well, it hurts more, actually.” He pulled his robe out and away from his middle. Cereid hesitated, then nodded and dashed off. Lilike watched him go, still worried about why her salve had burned him. She knew she should have insisted on seeing the rash. What did Cereid know, after all, about such things? Instead, she had let his modesty and her own feelings for him sway her judgment into accepting what he had asked. Lilike’s mouth remained open. Tasia’s monologue was fast-moving and forceful, and the euilamon barely looked at her as she spoke. Before Lilike could try to interrupt the woman, Tasia continued. “Young people these days have the most shocking ideas about how lovers should behave. I’m sure there was a good reason that you thought that having your man apply grease to himself in public while you didn’t watch was stimulating, and perhaps it was. But Randiriel teaches that lovers of any age should experience one another’s body directly and not be shy about each other. She also states that both partners should be equal, that pleasure is not one or the other’s responsibility but should be shared by both, given and received equally by each of you. “There’s no need to be embarrassed, my dear,” Tasia said. “Randiriel passes no judgments, so neither do I. This incident will not become gossip in our temple, despite what you may have heard about us. I could tell that there are feelings between the two of you, and if you insist on expressing them in that manner, it is all the same under Randiriel’s eyes. But she has lessons to impart, and I know that you two could benefit from them if you only gave her teachings a chance. Lilike resisted the urge to stick her fingers in her ears, scrunch her eyes closed, and hum loudly; she wasn’t a child any longer. She changed tactics instead, saying, “Thank you, Euilamon Tasia, for showing me the error of our ways. I’ll tell my … lover … of your advice. I’m sure it will improve relations between us. And if we have any more questions about the mechanics of … pleasure … I’m sure that we will come to your temple first. “Now I need to go find him to give him the good news. Many, many thanks! I’m so glad that you crossed our path. Farewell, and happy Melrin’s End!” She darted away before the nosy priest could utter another word, glancing back once to see the woman walking away with a satisfied smile on her face. Lilike thought that it was nice that someone had gotten pleasure out of the last several menes. Lilike slipped out of the ballroom and into the servants’ corridors. Cereid had come this way, and she was sure she knew where he had gone. The only place certain to have water available was the kitchens. As she walked, she realized that her embarrassment was as much for the euilamon’s assumptions as her own fantasies about those assumptions coming true, fantasies that had gained fodder from the accident. A moment later she turned a corner and found herself face to face with the other euilamon. Lilike looked at Courtney’s serene face and felt almost as if Araminia herself was speaking to her through the young woman. She remembered Rebecca’s lessons on matching cures to ailments and realized why her teacher had taken so much time to drill them into her. She also realized what would happen if someone put her salve on an injury that wasn’t the right kind of rash. “Thank you, Euilamon Courtney, for sharing your wisdom with me. I will never forget what I have learned. Now I must find Cereid and do what I should have done at first to make sure my friend is healed.” She bowed awkwardly to the priestess and pressed on to the kitchens. Cereid’s eyes squeezed tightly shut as his hands reached for the hem of his robe and slowly lifted it all the way to his chest. Lilike hunkered down in front of her wounded friend. She couldn’t help smiling as she took a good look at what she had only glimpsed earlier in the ballroom. Judging by the size of the serpent’s forked tongue the water had been cold indeed. Then she pressed those thoughts aside as Euilamon Courtney’s words came back to her, calling on the professional in her to assert itself. Lilike was only half-listening to Cereid’s story even though she was glad to get it out of him. The burn wasn’t serious, but it had blisters here and there, some of which were broken. It was no wonder her salve had burned him. She felt a small flare of irritation at him for concealing his actions. She knew she had to apply the proper cure and quickly, as those kinds of blisters could become infected quite easily. Lilike had learned about burns from Rebecca. She knew that it would take her a day or more to gather the proper ingredients — bark and herbs — to make a tincture to speed the healing of the burns, but she didn’t have that long. Anger at her friend and worry for his injuries wavered in her mind as she stared at the burn. Suddenly she remembered the servant who had come to Rebecca to replace her employer’s kitchen stock of burn-sop. Rebecca had explained that large kitchens usually kept the tincture prepared and ready should a pot boy or clumsy server have an accident around the fireplace or stoves. Of course, Dargon Keep probably had a magical healer within its walls, but would that worthy be bothered by every scald or blister? Standing, Lilike moved back into the kitchen and quickly examined the hot areas. She found no wax-sealed jugs or covered dishes there. Then she glanced at the pantry door and stepped back inside, where she found what she was searching for, marked just as Rebecca had marked the one for her client. Lilike grabbed the jug, a jar of honey, and some clean rags. Returning to Cereid, she saw that he was still standing with his robe held high, a pitiful and vulnerable look on his face. Her heart melted then. Friend or not, here was someone suffering because of her mistake. Tears of shame welled in her eyes, and she had to bite her lip as she knelt in front of Cereid. She wetted down one rag from the jug and began gently blotting the burns in front of her. She took care with the blisters, but she made sure to be thorough. Next she slathered honey all over the same areas, and plastered the rest of the rags as best as she could on top of the wounds. “Oh, no, I couldn’t –” Cereid started, but Lilike placed her hands firmly on his chest and he stopped. “Good.” Lilike lowered her hands and stepped away from him, noticing his warmth and aroma only as she left it. She looked away, towards the door, grateful that they had not been interrupted. “We’ve both learned something today.” She began to leave, and then stopped with a bright smile on her face. She looked over her shoulder and said, “And perhaps the next time I ask you to lift your robe it will mean something entirely different.” With Cereid’s astonished look in her memory she continued on her way out of the keep.